If you decide that your package needs one or more vignettes (which I strongly recommend), then you need to add a subdirectory called vignettes/. You can have as many vignettes as you consider convenient. 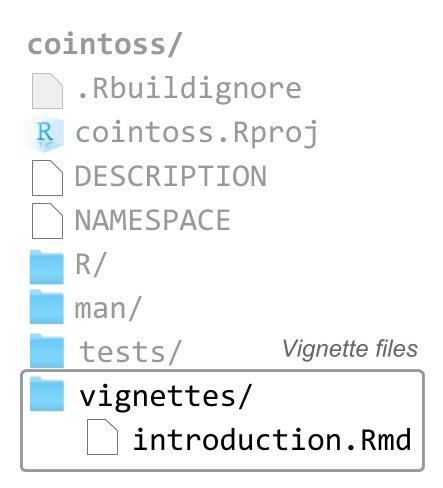 Inside the vignettes/ subdirectory, you add either .Rmd (R markdown) files or .Rnw (R noweb) files. Since the markdown syntax is simpler than latex, I prefer to use .Rmd files to write the content of the vignettes. date: the default value will insert today’s date (but can choose a differnt date). output: although there are various output formats available for .Rmd files, when used for vignettes you need to specify rmarkdown::html_vignette. This format has been specifically designed to work well inside packages. vignette: this is the last yaml field which contains a special block of metadata needed by R. You only need to modify the \VignetteIndexEntry to provide the title of your vignette. The other two lines should not be changed. They tell R to use knitr to process the file, and that the file is encoded in UTF-8 (the only encoding you should ever use to write vignettes). 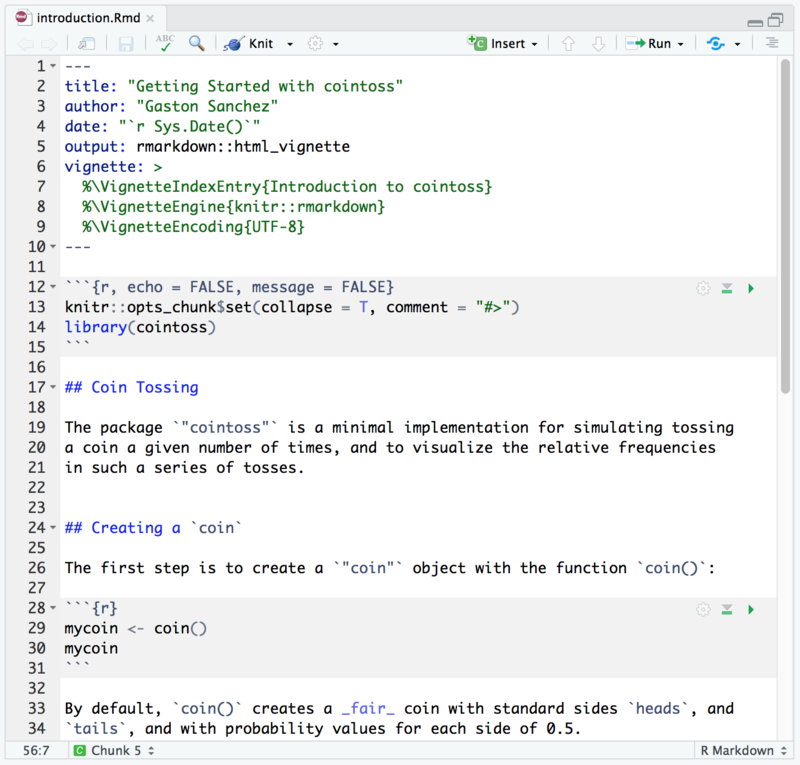 The following screenshot shows part of the contents in the introductory vignette for the working example package "cointoss". Notice that there is a code chunk with the library() function in order to load the package: e.g. library(cointos. To know more about vignettes see r-pkgs: Package Vignettes.